The late 1800s (the Victorian Era) and early 1900s were an eclectic time characterized by a struggle between puritanical restraint and unbridled emotionalism. Homes were cluttered with bric-a-brac, huge potted plants, and cloth-covered furniture. Crazy quilt with elaborate, intricate stitching. A wave of nostalgia for the past developed during this time, generated by the stresses and uncertainties of the rapidly changing world of the Industrial Revolution. It was in this environment that the frivolous, extravagant Crazy quilt made its appearance. Made from delicate silks and velvets for display, rather than as functional bedcovers, crazy quilts were principally employed as throws that were kept in the parlor. They were also referred to as "slumber robes" or "couch throws." 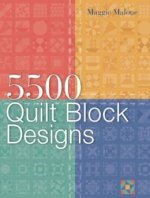 Instead of geometric patches arranged in an established pattern, irregularly shaped scraps are pieced together, usually into blocks that were later joined. The blocks were often irregular shapes and sizes. The term crazy is defined as "full of cracks or flaws, as having the appearance of crazed pottery, broken into irregular segments." These quilts only seem to be the work of lunatics. 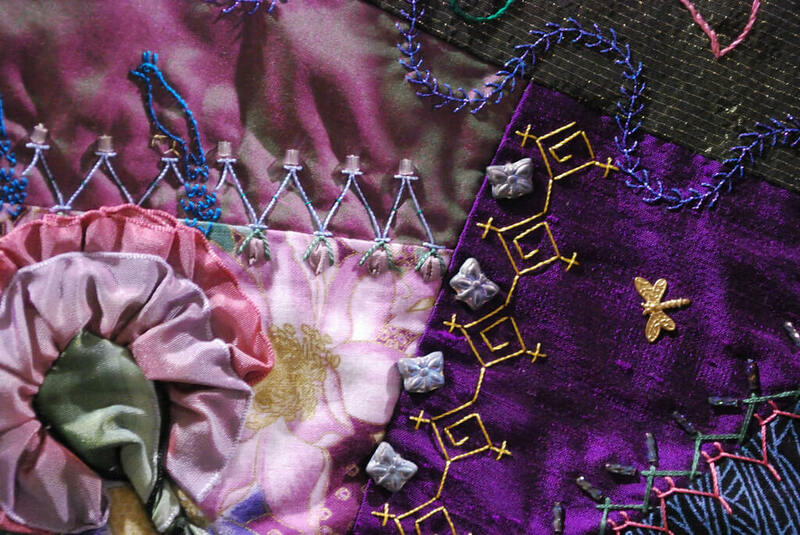 Closeup of a crazy quilt's elegant fabrics and intricate stitching. 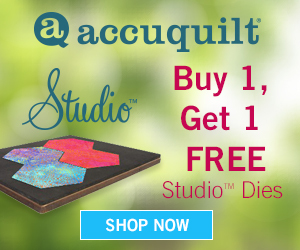 Favorite materials for crazy quilts include rich, dark silks, velvets, brocades, satins, and taffetas -- either new, left over from dressmaking, or salvaged from worn-out garments and home furnishings. These quilts were seldom made from light-colored fabrics. 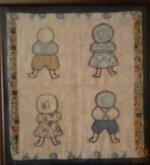 Some crazy quilts were made as memory quilts -- as a way to record a family history -- using unusual items, such as pieces of clothing, ties, or hat bands -- sometimes with the dates of the owner's birth and death, or some other information embroidered on the scraps. The most typical examples of crazy quits were lavishly embroidered with a variety of threads for added elegance. The seams between the patches are covered with embroidery stitches -- the feather stitch is quite common -- to hide the raw edges. Additional embroidery stitches are then worked on the patches. The work was fragile, as were the materials, and practically useless as a bedcovering. Crazy quilts were also difficult to clean. 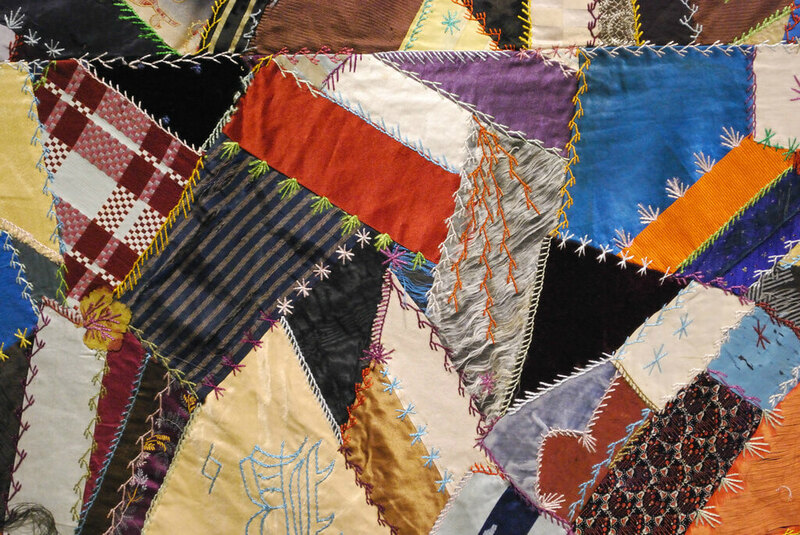 While constructed as quilts with three layers, crazy quilts were rarely actually quilted. Instead, they were usually bound and tied to a backing.